Typical case of “Oops!”. 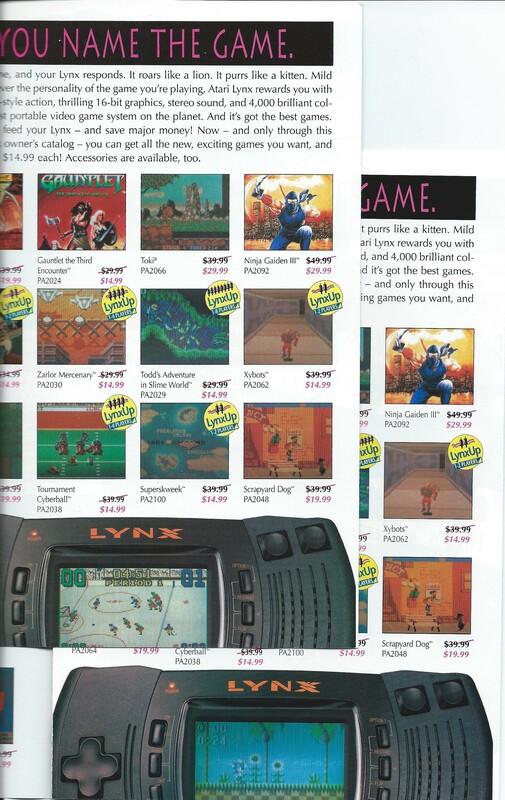 An Atari Lynx folder was published showing some “screenshots” of cool and upcoming Lynx games. But, … the marketing company made a mistake when composing the screenshot in the middle of the folder. They accidentally included a title that never appeared (or will ever appear for that matter) on the Lynx. See for yourself with the original and corrected folder pages scanned together. 4 Responses to The wrong cat wants to play. which magazine is it ? It wasn’t a magazine, but an advertorial leaflet. I will put up scans in the Resources section later. Sonic ? Wow that’s weird ! According to some magazines from backthen, there was a gamegear addon planned to allow you to play gamegear games on the lynx,now you may wonder ,how is that possible if the cartride is not directly connected to the cpu?,the andure might be that the lynx is an digital video input to stream data directly to the lcd screen to avoid a heavy load of cpu intervention. If this is not the case, it might be possible to stream data in sections of 512KB to the lynx (a pugeot demo proved that animation is possible on lyn!!?? )but the downside of it is that it requires a heavy load of cpu work and it’s Dram needs to be refreshed all the time.